Caterpillar Local Host Plants: Two species to be identified. A Yellow Banded Awl perching the broken end of a branch. A Yellow Banded Awl perching on the underside of a palm frond. Adults are rather large in size with pointed forewing apex and markedly lobate hindwings. Above, the wings are dark brown. 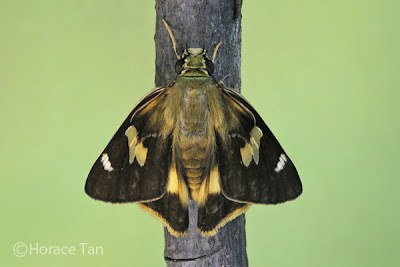 For both sexes on the forewing, there are four whitish sub-apical spots, and three rather large yellowish hyaline spots, one each in the cell and in spaces 2 and 3. These hyaline spots are adjoined to form a broad but irregularly-outlined band. The male has a yellowish discal stigma. 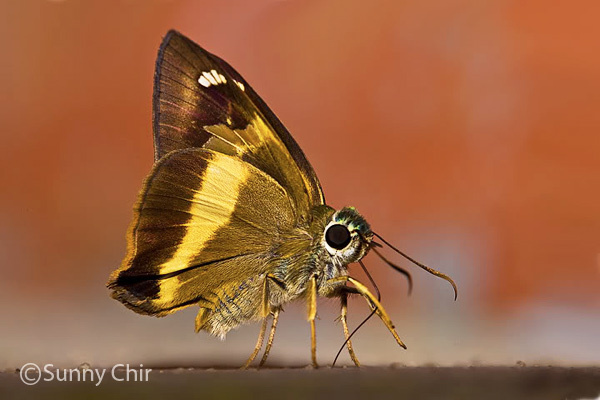 On the hindwing, there is a broad yellowish discal band and the wing borders are marked with yellowish cilia. Below, both sexes are similarly marked as per the upperside but with wing bases in paler brown, and that the apical to post-discal area of the forewing has a strong purplish sheen in some specimens. A partial view of the upperside of a Yellow Banded Awl. A side view of the same Yellow Banded Awl featured in the previous picture. 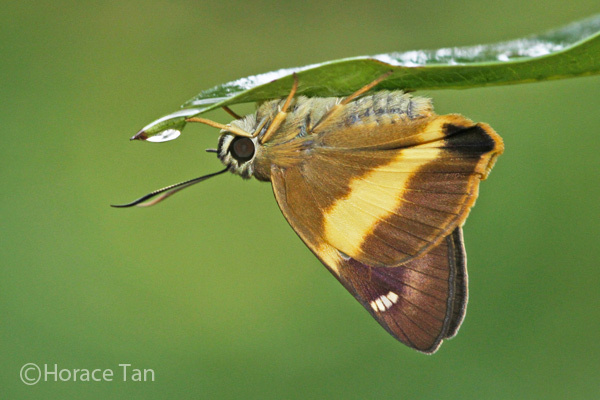 A Yellow Banded Awl found perching on the underside of a leaf after a shower. 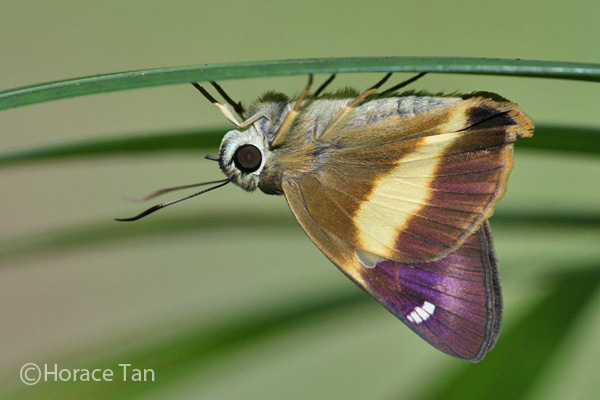 This species is uncommon in Singapore. Sightings of the adults have so far been confined to a handful of locations within the Central Catchment Nature Reserve. 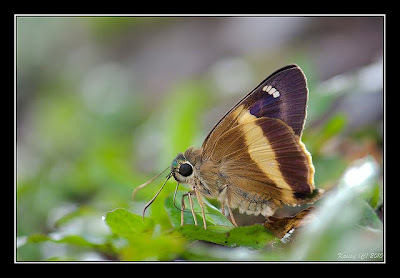 Typical encounters involve an individual flying among foliage alongside walking trails or at forest fringes, and occasionally puddling individuals on damp patches of soil. As with other Awl spp., the fast flying adults have a habit of resting on the underside of a leaf or other plant parts. 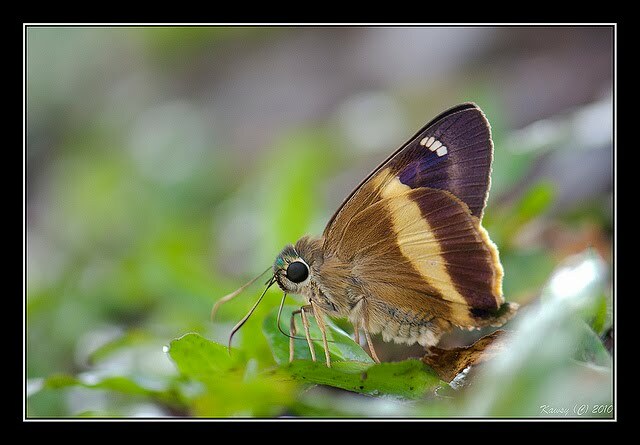 A Yellow Banded Awl puddling on a damp ground. A Yellow Banded Awl checking out the surface of a leaf with its proboscis. 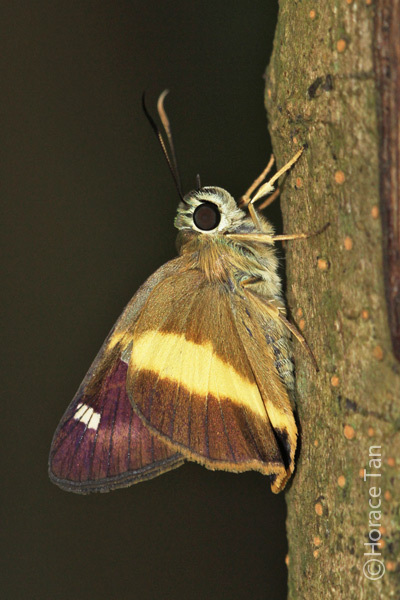 A Yellow Banded Awl perching on a tree trunk in the nature reserve. 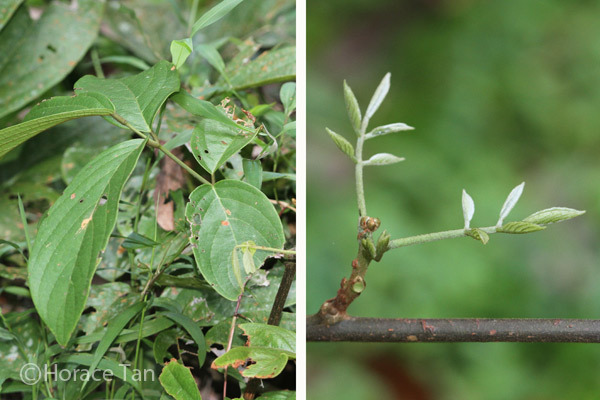 Two vines growing in the Catchment Reserve have been recorded as the local host plants. The first is tri-foliated with smooth leaf surface while the second is 5-foliated with leaf surface covered with dense short hair. Their exact species ID are yet to be established. 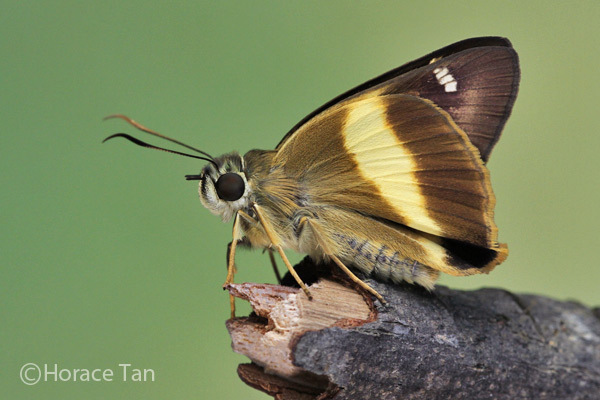 Igarashi and Fukuda, in their voluminous book on life histories of Asian butterflies, mentioned Fordia ngii (Malay Peninsula) and Spatholobus palawanensis (Palwans) as host plants of the Yellow Banded Awl. It is likely that the two local host plants also belong to the same genera (within Leguminosae). Caterpillars of the Yellow Banded Awl feed on the very young to the moderately young (before hardening) leaves of the host plants. 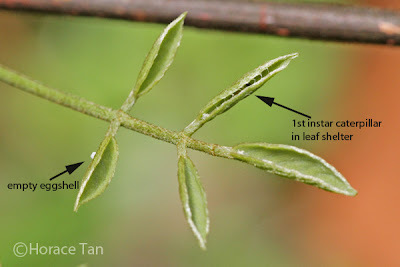 Host plant #1; a vine with tri-foliated leaves, with smooth leaf surface. Host plant #2: a vine with 5-foliated leaves, with "rough" leaf surface. The eggs are laid singly on very young shoots of the host plants. 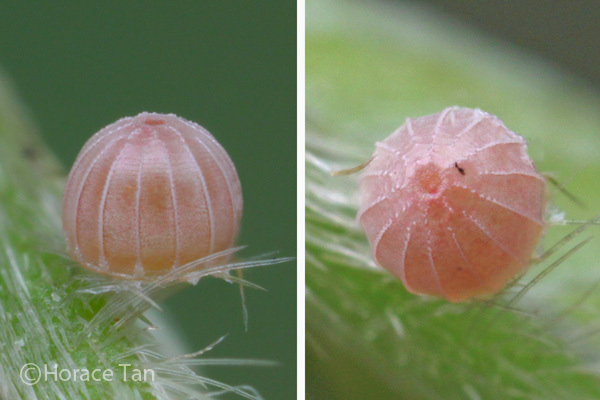 Each egg is shaped like a bun with a flattened base (diameter: 0.8-0.9mm). Prominent ridges run from the pole to the base. The micropylar sits atop at the pole. The entire egg turns salmon red as it develops, and then decolorizes again when the caterpillar is ready to emerge. Two views of an egg of the Yellow Banded Awl, likely be one-day old. Two views of a mature egg of the Yellow Banded Awl. Two views of an empty egg shell of the Yellow Banded Awl. It takes 2 days for the collected egg to hatch. The young caterpillar eats just enough of the shell to emerge, and has a length of about 2mm. 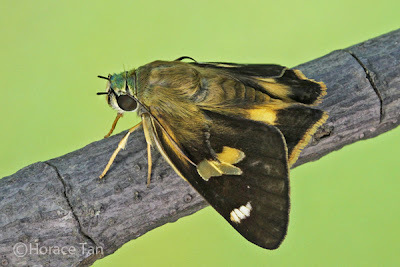 It has the typical cylindrical shape for skipper caterpillars, and the yellowish body has a number of short white setae and lateral orangy patches. The large head is black, slightly bi-lobed and lightly hairy. 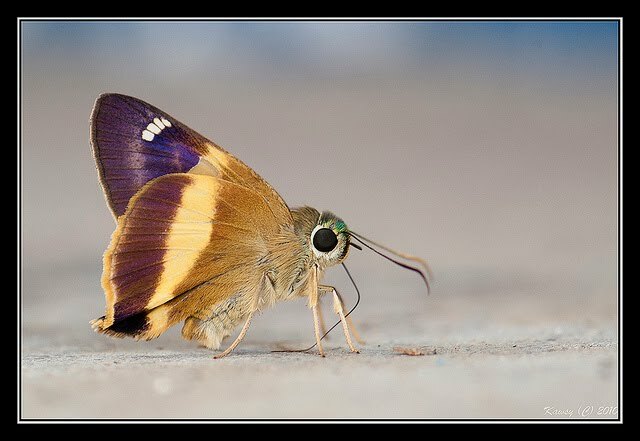 The dorsum of the prothorax carries a dark-colored patch/shield. Two views of a 1st instar caterpillar, early in this stage, length: 2.3mm. A newly hatched caterpillar checking out its surrounding on host plant #2. The young caterpillar constructs its first leaf shelter by bringing two halves of a small young leaf together with silk threads. 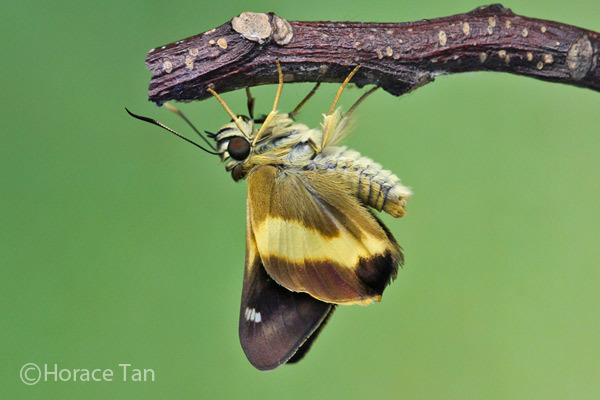 It rests within the flap and ventures out to eat on nearby leaf surface. 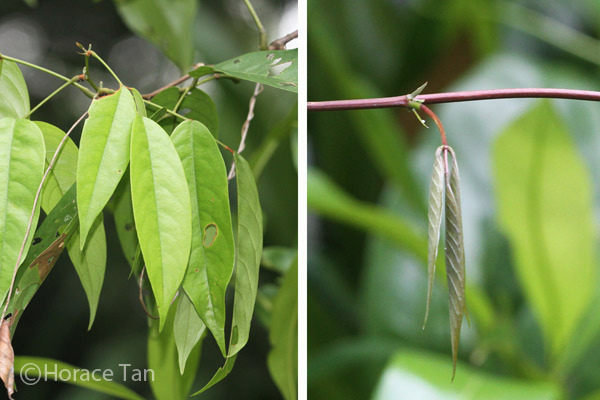 In later instars, the Yellow Banded Awl caterpillars also construct leaf shelters in a similar fashion but do so with larger and older leaves. 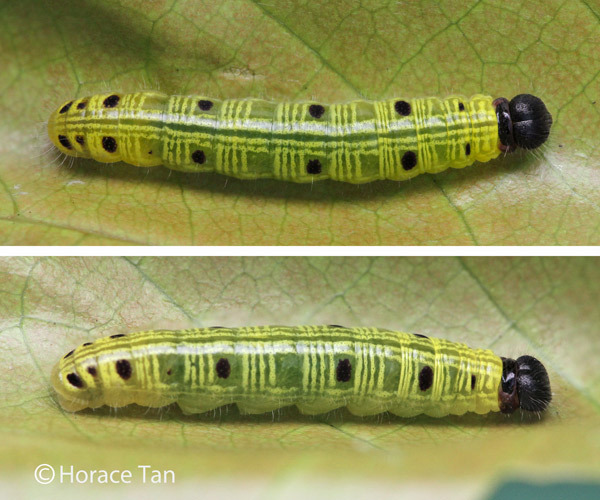 The larval growth of the Yellow Banded Awl is rapid in pace for all instars, with all but the final instar lasting only 1-1.5 days. A field shot of a pinna of host plant #2 showing an empty eggshell and a 1st instar caterpillar in a leaf shelter. Two views of a 1st instar caterpillar, late in this stage, dormant before its moult, length: 3.5mm. 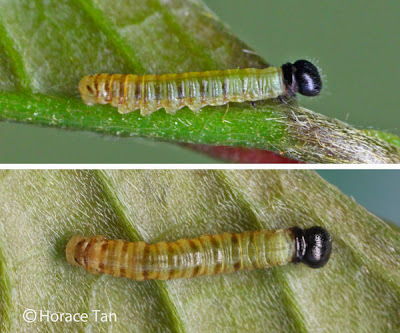 After reaching a length of about 3.5mm in the 1st instar, the caterpillar moults to the next instar after a short dormant period. 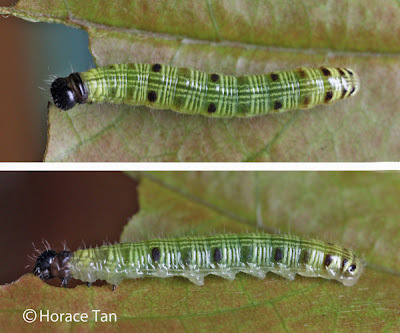 The 2nd instar caterpillar has four faint whitish narrow dorsal bands which are barely visible against the yellowish green ground color. There are lateral patches, brown initially but blacken gradually, one to each of all body segments except for the anterior two. The body and the black head capsule are covered in short fine setae. 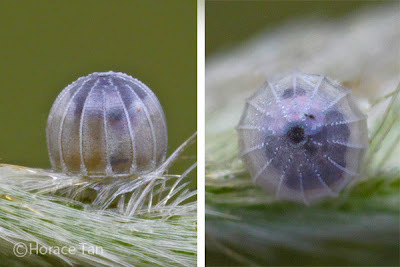 Toward the end of this instar, faint pale rings become visible on the body segments. 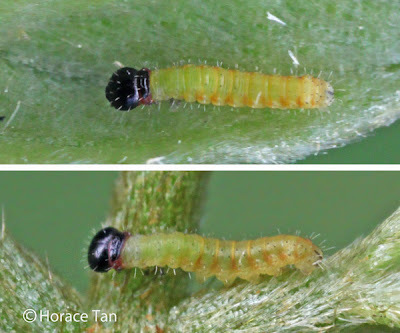 Two views of a 2nd instar caterpillar, early in this stage, length: 5mm. 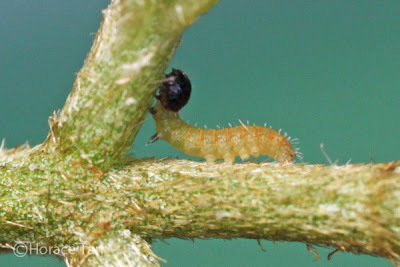 A 2nd instar caterpillar, late L2. Top: length: 7mm. Bottom: dormant before the next moult. The 2nd instar caterpillar reaches a length of about 7mm, and after 1.5-2 days in this stage, it moults again. The 3rd instar caterpillar resembles the 2nd instar caterpillar but with broader and more prominent dorsal yellowish bands and segmental yellowish rings, all set against a more greenish body colour. The lateral dark patches are now more prominent on meta-thoracic segment, abdominal segments 2,4,6,8-10 but those on other segments appear to fade away. 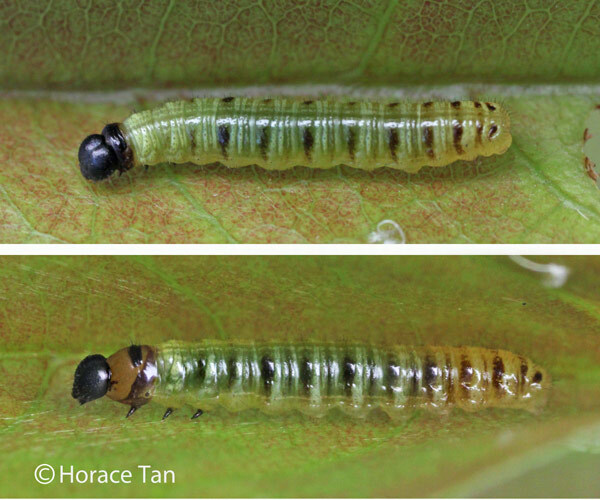 This instar lasts another 2 days with the length reaching 11-12mm. 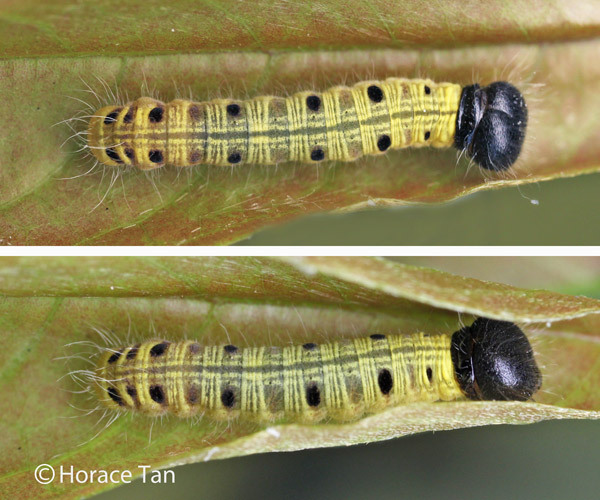 Two views of a 3rd instar caterpillar, newly moulted, length: 7.5mm. 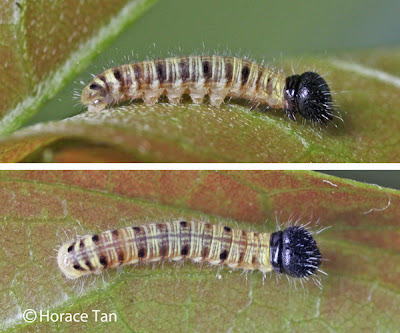 Two views of a 3rd instar caterpillar, late in this stage, length: 14mm. A 3rd instar caterpillar, dormant before the next moult, length: 13mm. The 4th instar caterpillar resembles the 3rd instar caterpillar closely, but with dorsal bands and segmental rings much more constrasting, and the dark lateral patches better defined. 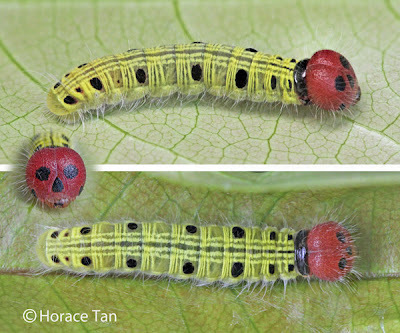 The head capsule is still black for most 4th instar caterpillars, but some specimens have been observed to feature small lateral patches of red to reddish brown. This penultimate instar takes about 2 days to complete with the body length reaching up to 24mm. Two views of a 4th instar caterpillar, newly moulted, length: 12mm. 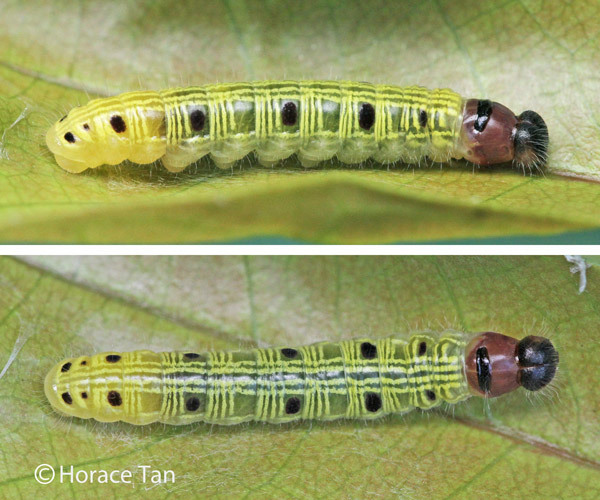 Two views of a 4th instar caterpillar, length: 15.5mm. 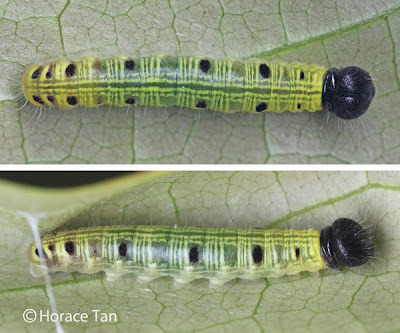 Two views of a 4th instar caterpillar, length: 22mm. A 4th instar caterpillar, dormant before the next moult, length: 24mm. 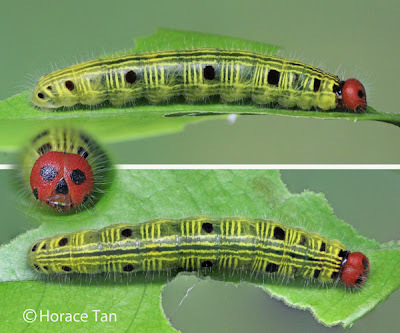 The final and 5th instar caterpillar has similar body markings as the 4th instar caterpillar. Noteworthy is that an additional pair of dark lateral patches, though small in size, appear on the meso-thorax. A much more striking change is in the head capsule which has now become reddish or orangy red. Set against this brightly coloured background are two lateral round black spots and one triangular black spot on the frons (about the labrum). White setae adorn the head capsule as well as the entire body. This stage takes about 4-5 days to complete with body length reaching up to 42mm. Two views of a newly moulted 5th instar caterpillar, early in this stage, length: 23mm. Two views of a 5th instar caterpillar, late in this stage, length: 42mm. Towards the end of 5th instar, the body of the caterpillar gradually shrinks in length and decolorises, losing all its yellow luster in the process. 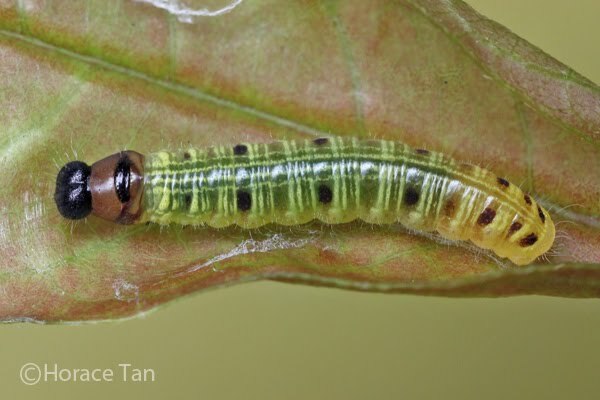 The fully grown caterpillar ceases feeding and stations itself in a leaf shelter. 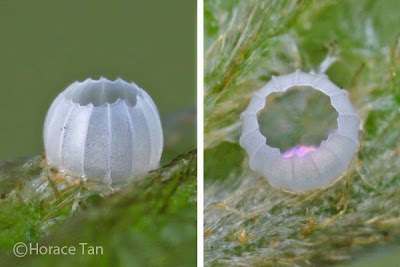 During the early part of this pre-pupal stage, the caterpillar spins large quantity of silk threads to seal the pupation shelter, and in particular, constructs a silk girdle at its 2nd/3rd abdominal segment and a short transverse silk band near its posterior end. Both the dorsal point of the girdle and the transverse band are also secured by vertical/oblique threads to the inner wall of the shelter. Two views of a 5th instar caterpillar, ceased feeding and shrunken, length:30mm. 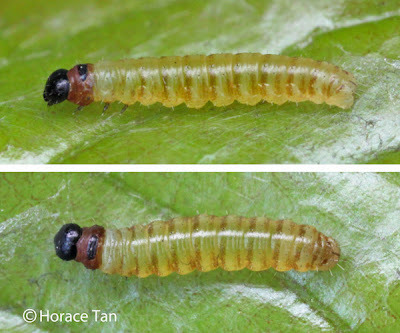 Two views of a pre-pupa of the Yellow Banded Awl secured in its pupal shelter. Note the dorsal girdle and posterior transverse band. 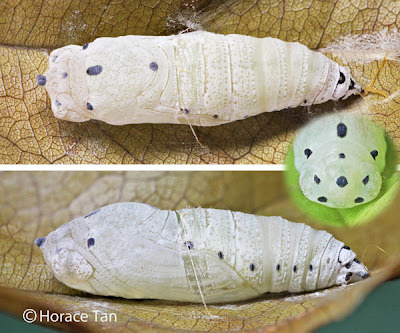 After about 0.75 day of the pre-pupal phase, pupation takes place within the pupation shelter. The pupa secures itself with its cremaster attached to the transverse band. The pupa has a short thorax, a rather long abdomen and a short and pointed black rostrum. 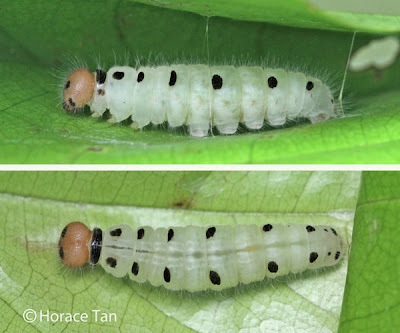 Fresh after the pupation event, the body is pale whitish with a light greenish undertone, but after 0.5 to 1 day, the body surface becomes mostly covered in a white substance. Several black spots adorn the dorsum of the thoracic segments. The spiracles are marked in black. 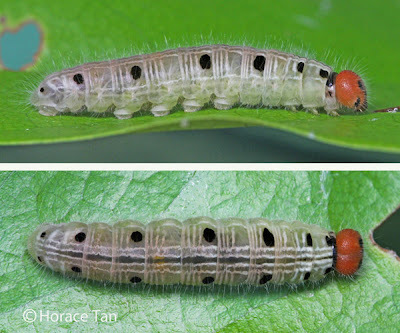 Length of pupae: 22-23mm. 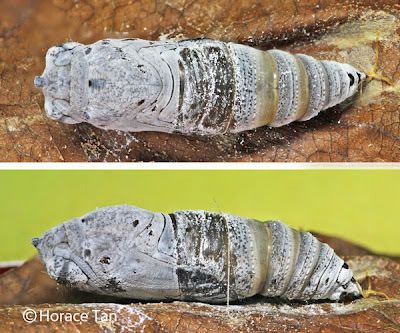 Two views of a pupa of the Yellow Banded Awl, early in this stage, still without the coating of whitish powdery substance. Two views of a pupa of the Yellow Banded Awl, day 2 in this stage, now with the coating of whitish powdery substance. After 8 days, the pupa becomes darkened in color signaling the imminent emergence of the adult. 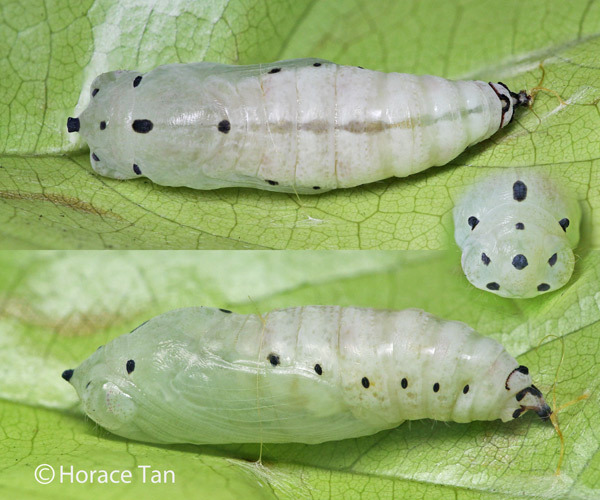 The next day the adult butterfly emerges from the mature pupa. A newly eclosed male Yellow Banded Awl still awaiting its wings to be fully stiffen up. The Life Histories of Asian Butterflies Vol.2, Igarashi S. & Fukuda H., Tokyo University Press, 2000. Your photos are amazingly beautiful and detailed!